The Head of the Veterinary Practice in Helston says one of their clients had devastatingly lost six of her nine pet rabbits from the deadly virus. 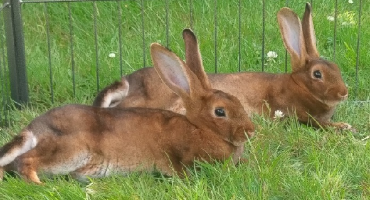 "These rabbits were very well cared for and had not left their enclosed garden, which worryingly indicates the virus - which is extremely contagious - may have been carried in by wildlife. "There is no treatment available once a rabbit has contracted the virus and they are likely to die very suddenly without prior signs of illness." One of a pair of unvaccinated but otherwise fit and healthy young rabbits has passed away from very strongly suspected RVHD. He had been off colour and was admitted by the vet who suspected the illness. He was treated with antibiotics and a drip but passed away within 6 hours. A PM was performed and he had haemorrhaged into his lungs. Samples have been sent for testing. The surviving rabbit has been vaccinated but there are concerns that he is under the weather. Whether this means he's infected, or just missing his brother it isn't yet known. At the same time it was reported that the lady had heard of a case in Washington (which borders different postcode areas including mostly NE37 but also NE10, DH3 and DH4) where 3 otherwise healthy rabbits in the same household passed away within a few hours of each other. It's ridiculous... Don't all vets say ah here's your vaccination - now come back in two weeks for the second vaccination?! My original very un rabbit savvy vet said that to me.. The RWAF have and are doing so much to update and inform Vets/Petshops/BRC about it all. If it were not for Richard Saunders (one of the RWAF Veterinary Advisors) we may not even have a licensed vaccine against RHD2 yet. His CEVA award for Vet of the Year was very much deserved. But of course there will be a few Veterinary Professionals who do not take on board the serious threat RHD poses. Those Vets really are in the minority now though. It's poor advice from Pet Shops, where most 'new to Rabbits' people obtain their Pets go, that can be a far bigger problem. If accurate advice were given at point of sale then I believe there would be a lot less heartbreak. Last edited by Jack's-Jane; 29-08-2018 at 04:39 PM. Many vets sadly don't even recognise it as a problem. I wish they would read the reports that are coming out. I would ask though, that if quoting a Facebook link, that you copy and paste it here, or provide an alternative non-Facebook link if possible. It's viewed by so many people without Facebook accounts, so I go to great pains to keep this thread updated. The information is then available to people like myself, who don't have a personal Facebook account.